kflyer 169 2.8 2.8 Male No Applied Still in review as of 4/1. ibe84 164 3.6 3.6 Political Science Male No PA 2010 Accepted Attending. Fee Waiver. Accepted 3/12. $10,000 per year/$30,000 total scholarship. genius5432 160 3.4 3.4 Political Science Male No PA 2012 Accepted $15,000/year with a 3.0 stip. 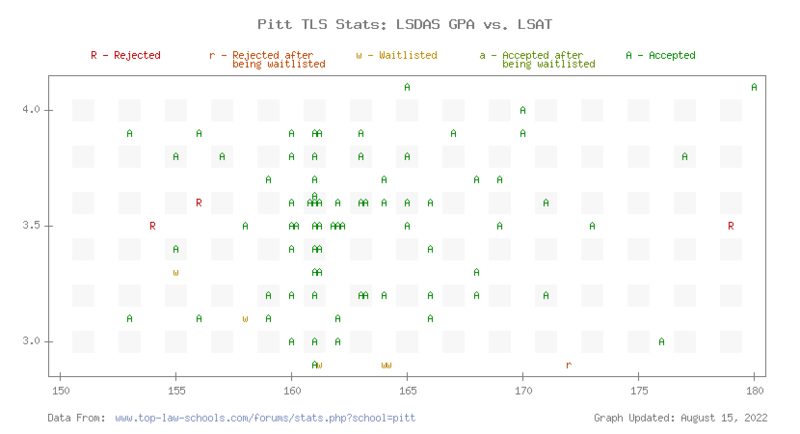 Be sure to check out the TLS Profile on Pitt Law.